graphene Archives - Touch Display Research, Inc.
On October 3rd, Cambrios, TPK and NISSHA signed the expansion of joint venture– TPK Film Solution. Back in August, in our “Touch and Emerging Display” monthly report, we’ve reported that TPK will produce silver nanowire type film touch panel by end of this year. The interesting thing of yesterday’s news is that NISSHA also joined it. NISSHA has been producing ITO film touch panel before. ITO (Indium Tin Oxide) is currently the mainstream transparent conductor. However, due to its high cost, long process and fragility, non-ITO type transparent conductors are gaining momentum. Over 180 companies and research institutes are working on ITO replacement in 2013. 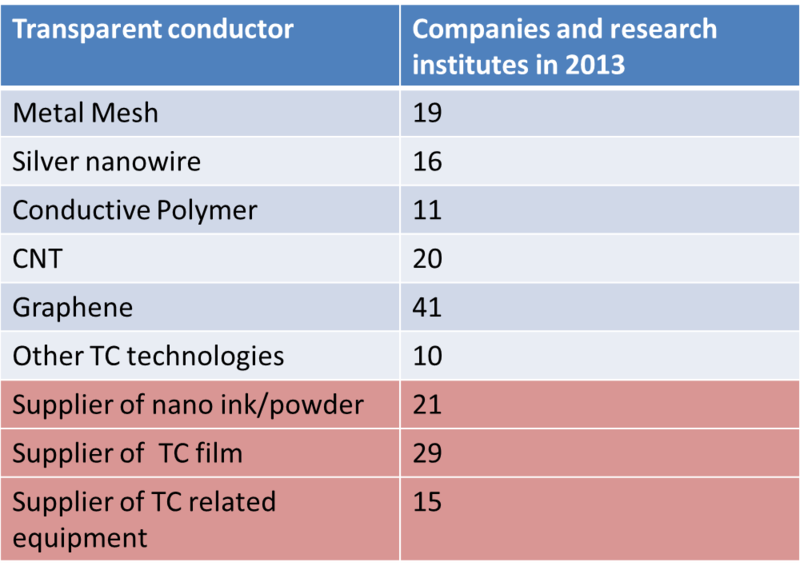 Sixteen companies and research institutes are working on silver nanowire. Metal mesh, carbon nanotube, conductive polymer and graphene are also popular ITO-replacement transparent conductors. This entry was posted in Displays and tagged Cambrios, carbon nanotube, conductive polymer, graphene, Indium Tin Oxide, ITO film, ITO Replacement, joint venture, metal mesh, NISSHA, silver nanowire, touch display research, Touch panel, Touch screen, TPK, TPK Film Solution on October 4, 2013 by jennycolegrove. Over 180 companies and research institutes are working on ITO replacement in 2013. ITO (Indium Tin Oxide) is currently the mainstream transparent conductor. However, due to its high cost, long process and fragility, non-ITO type transparent conductors are gaining momentum. Transparent conductor applications include touch sensors, displays, lighting, thin-film solar (PV), smart windows, and EMI shielding. Graphene is the most researched non-ITO material with 41 companies and research institutes working on it. Carbon nanotube and metal mesh are the number two and three. Twenty-nine companies supply non-ITO transparent conductive film. Twenty-one companies supply the nano ink or powder. Several companies are already mass producing these advanced transparent conductive materials. Atmel has been mass producing XSense for several months. Fujifilm is currently expanding its EXCLEAR capacity. UniPixel is starting the mass production of UniBoss. Cambrios is leading the silver nanowire transparent conductor. This entry was posted in Displays, ITO replacement, Touch screens and tagged display, graphene, Indium Tin Oxide, ITO Replacement, large-screen television, Touch screen, touchscreen on May 18, 2013 by jennycolegrove.